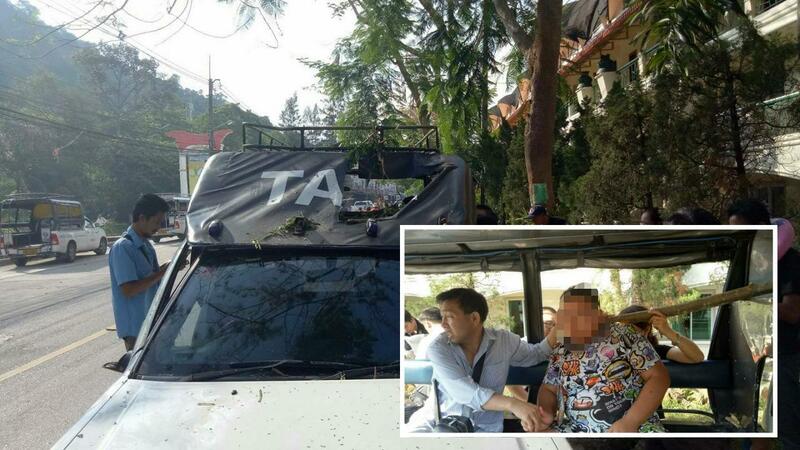 Two Chinese tourists were injured when branches from a tree fell onto the roof of a song thaew parked by the roadside in Koh Chang, Trat. One large branch pierced the canvas roof of the vehicle and went into the neck of one male tourist causing a wound of two centimeter depth. Another tourist was slightly hurt by being hit in the head. Witnesses said that the branches came down in only a light breeze. The victims were treated at the scene that was opposite the Koh Chang Resort Hotel and were taken to the International Clinic for further treatment. Both were improving. Neither were named by Thai Rath. Later the local authority were seen cutting branches of trees in the vicinity of the accident. these Chinese tourists need to toughen up a bit if they want to hang out in Thailand. Why is songthaew in inverted commas? I know seemingly the entire Thaivisa team lives in Pattaya and you can't conceive anything not referred to as a "baht bus" but they are called Songthaews in the rest of the country. You know what they say, cure is better than prevention!